Shadows are a nifty addition to Counter-Strike Source that many players do not take advantage of. When i talk about shadows, I'm not referring to the ones cast from walls and such, but rather the ones cast by props or models. These shadows are calculated in real-time and are dynamic as opposed to the static shadows cast by level geometry. When dynamic shadows are properly understood, they can provide a significant advantage over your opponent both offensively and defensively. Being able to see someone's shadow before they even peek, gives you quicker reaction time, and knowing how to conceal your shadow, prevents that your opponent gets the same advantage. By default, shadows are set to low. 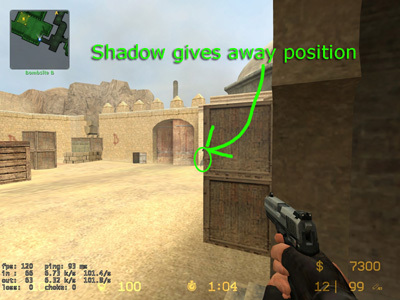 As shown in the example below, low quality shadows cast a small blurry circle beneath the player, giving no real insight to a player's position. In high quality mode however, we can clearly see the player's shadow, and if he was behind a wall, use it to our advantage. They take more resources to run on high but are absolutely necessary if you want to play competitively. 3.) Set "Shadow detail" to "High*"
After setting that option, you should see shadows on your team-mates and props, but not yourself. Shadows should now be enabled. 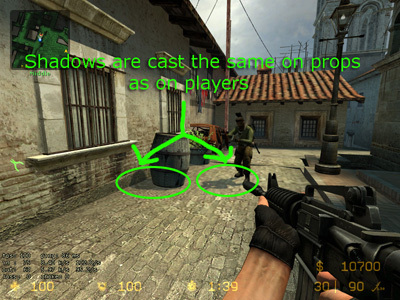 For whatever reason, Valve didn't implement the ability to see your own shadow, which makes it even more important to understand what direction it's casting. The important thing to remember is that shadows are cast in the same direction throughout a map. Only one light source (light_environment entity) controls the direction the sun is shining, even if you are INSIDE!. Once you learn what direction the sun is casting for each particular map, you can then be consciously aware of how your shadow is casting to other players. What direction is it casting? 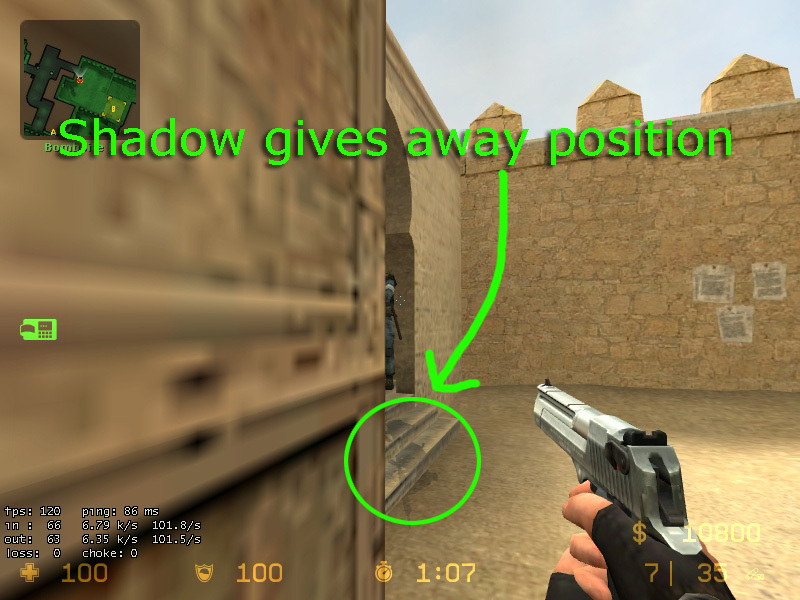 It should be pretty obvious that by looking at your teammates shadows, you can see what direction your shadow will be cast. If for whatever reason, you don't remember what direction your shadow is casting, you can also look for props like barrels which cast real time shadows. Make a note to go through every map to find out which direction the light is casting, and try to think about what your opponent may see. The following two examples illustrate how critical it is to be aware of what direction your shadow is casting at all times. Don't let your opponent get the jump on you like in the above screen-shots. 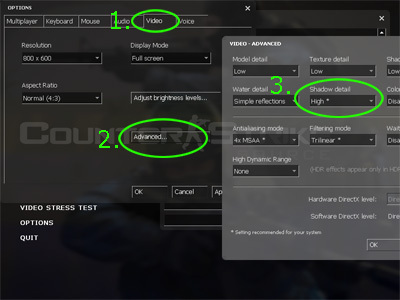 Counter-Strike is heavily based on reaction time and although it may not seem like a huge advantage, that extra second or two can be the difference between living or dying. Go through every map and learn what direction the sun is casting; be consciously aware of your shadow in the eyes of your opponent. I promise you won't regret it.